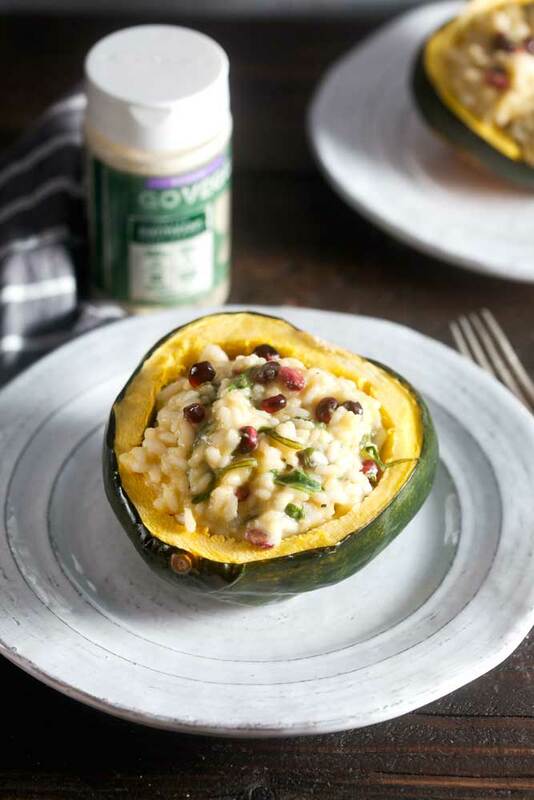 Acorn Squash Risotto with Pomegranate and Arugula | Healthy. Delicious. 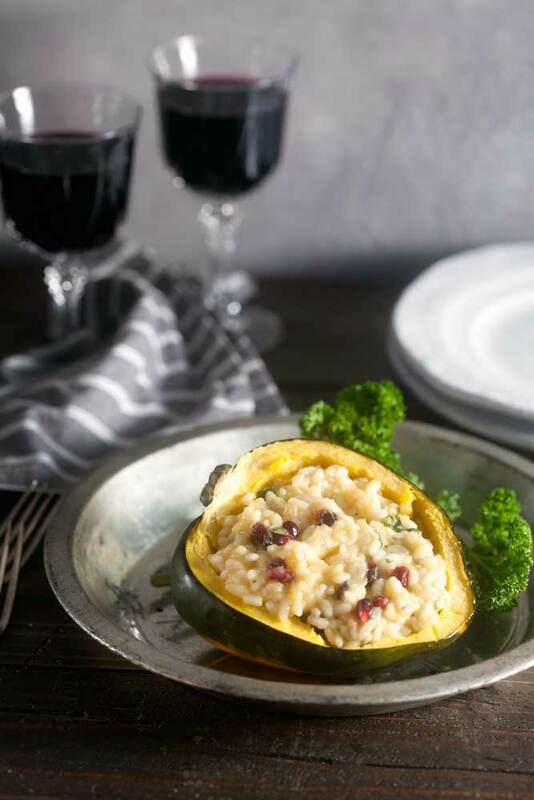 Roast acorn squash stuffed with risotto makes is a festive recipe that can be savored by vegetarians, vegans, and those on gluten-free diets. I created this recipe for my client, GO VEGGIE. As always, thank you for supporting the brands that keep me inspired in the kitchen. A few years ago, I made a cajun stuffed spaghetti squash that was super popular. People loved that it could be enjoyed by almost anyone, from vegetarians and vegans to people who follow gluten-, lactose-, or egg-free diets. It also didn’t hurt that the squash makes a super cute serving container – or that it was amazingly delicious. This year, I was inspired to make something similar. I’m a huge fan of stirring squash puree into my risotto. It adds tons of flavor and makes the risotto extra creamy. I dressed up my traditional risotto with arugula and pomegranate arils, then added GO VEGGIE vegan parmesan grated topping to give it some extra oomph while also keeping it dairy-free. This risotto makes a really impressive dinner, but it’s surprisingly simple to make. Start by splitting your squash and sticking it in the oven. It will roast in just about the same time it takes to make the risotto. The squash is done with it can be easily pierced with a fork, but still has enough structure to stand upright. Use and ice cream scoop or large spoon to scoop out some of the inside, leaving about 1/4 inch of squash around the perimeter. The squash that you scooped out gets mashed and stirred into the rice, where it will add sweetness to every bite! Split the corn squash cross-wise and discard the seeds. Place cut-side up on a baking sheet and drizzle with olive oil. Bake 25 minutes, or until soft. Meanwhile, combine the stock and water in a saucepan and bring to a boil. Reduce to a low simmer and keep warm. Add the onions and a pinch of salt to a large, heavy-bottomed pan set over medium heat. Cook the onions 8-10 minutes, until soft but not brown. Add 1/4 cup of the hot cooking liquid to soften the onions further. Once the liquid has completely evaporated, turn the heat up to medium-high and add the rice; stir well. Toast the rice 2-3 minutes, or until mostly translucent, with just a pearl of darker white in the center of each grain. Add the garlic and cook 30 seconds. Stir in the wine; cook until all liquid evaporates. Add the stock in half cup increments, allowing the liquid to nearly cook off in between each additions and continuing to stir nearly constantly. 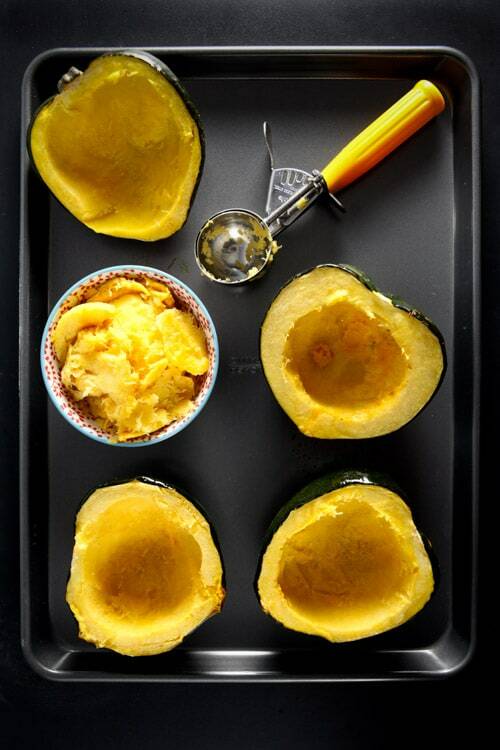 Scoop out some the acorn squash, leaving about a half inch border around the edges – you should have about 1 cup of squash. Mash the squash, then fold it into the risotto. Stir in the pomegranate arils, arugula, and parmesan. Season to taste with salt and pepper. Divide the risotto among the four squash halves and serve immediately. Top with additional GO VEGGIE parmesan, as desired. For a more substantial main course, this risotto is also delicious with 1/2 pound of cooked, crumbled hot Italian sausage stirred in before the final step. I love EVERYTHING about this! The risotto, the squash, the pomegranate. What a fabulous dish! Such a great idea! Love the risotto! That pop of pomegranate! Delicious! This is my kind of a dinner!! 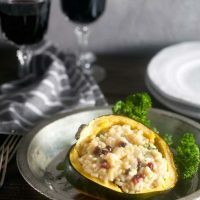 I love your idea of serving the creamy risotto inside of the squash. These are so pretty, Lauren – love the addition of arugula! I adore both risotto and acorn squash, so this combination is a winner for me. And pomegranates:) – well, you just won my heart as well as my tastebuds. I love trying different kinds of risotto dishes! This one looks so rich and flavorful!